RIO DE JANEIRO (AFP) - Revellers welcomed 2019 on Tuesday (Jan 1) with fireworks displays and festivities as a celebratory wave swept westward across the globe from Asia to Europe and the Americas, putting to bed a tumultuous 2018. In Rio de Janeiro, the city's famed hilltop Christ the Redeemer statue briefly came to colorful 3D life through light projections as it peered over Copacabana Beach, where pyrotechnics lit up more than two million white-clad Brazilians dancing to free concerts. The beach was lit up with hundreds of thousands of mobile phone screens as the massive crowd recorded the fireworks spectacle. New York was to follow with its iconic Times Square Ball drop, the highly mediatised epicentre of US jubilation. The global partying had kicked off on Sydney's waterfront with the Australian city's biggest-ever fireworks display, thrilling 1.5 million people. It then moved on to Hong Kong, where hundreds of thousands packed streets along Victoria Harbour for a spectacular 10-minute show that illuminated the night. 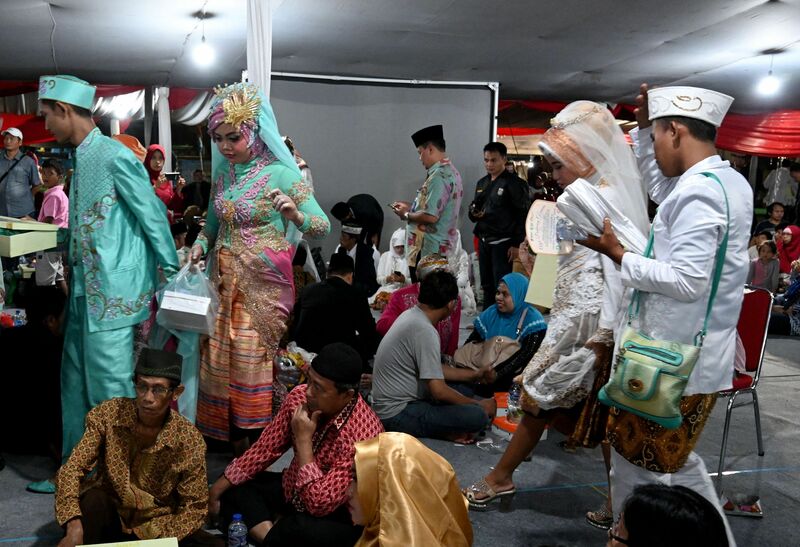 In the Indonesian capital Jakarta, more than 500 couples tied the knot in a free, mass wedding organised by the government to mark the arrival of a new year. Fireworks shows, however, were cancelled out of respect for victims of a December 22 tsunami that killed more than 400 people. In Japan, locals flocked to temples to ring in 2019, as US boxing superstar Floyd Mayweather came out of retirement to beat Japanese kickboxer Tenshin Nasukawa in a multi-million-dollar "exhibition" bout outside Tokyo. 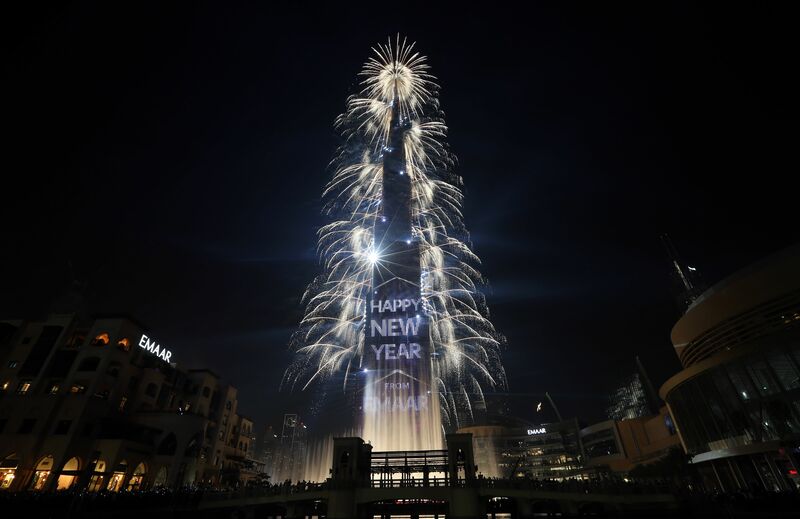 In Dubai, fireworks lit up the sky over the world's tallest building, the Burj Khalifa, to the delight of onlookers, while nearby Ras al-Khaima sought to enter the Guinness Book of Records with the world's longest fireworks show. Russia saw in the new year over several time zones. Concerts and light shows featured in Moscow city parks, and more than 1,000 ice rinks opened for merrymakers. But a tower block gas explosion that killed at least four people cast a shadow over festivities. In his New Year's address, President Vladimir Putin urged people to work together "so that all citizens of Russia... feel changes for the better in the coming year." In Paris, "fraternity"-themed fireworks and a light show were held on the Champs-Elysees, with a few "yellow vest" anti-government protesters mingling joyfully with the 300,000-strong crowd. French President Emmanuel Macron, in a televised address, acknowledged his government "can do better" but said "I believe in us." In Berlin, music lovers partied at the Brandenburg Gate. London ushered in the new year by celebrating its relationship with Europe, despite Britain's impending departure from the European Union. Mayor Sadiq Khan said the capital would remain "outward looking" after Brexit. In some African countries, election considerations shadowed New Year revelry. Election officials in the Democratic Republic of Congo were eschewing the partying to count votes from a presidential election that was held Sunday. In Nigeria, President Muhammadu Buhari promised a free and fair election in 2019. Ivory Coast leader Alassane Ouattara vowed to create a new, independent, electoral commission for polls planned for 2020. As the world celebrates, many are wondering whether the turmoil witnessed in 2018 will spill over into the next year. The political wrangling in Westminster over Brexit was one of the key stories of this year, with a resolution yet to be reached ahead of Britain's scheduled March 29 departure. US President Donald Trump dominated headlines in 2018, ramping up a trade war with China, quitting the Iran nuclear deal, moving the US embassy to Jerusalem and meeting his North Korean counterpart Kim Jong Un. North Korea's commitment to denuclearisation will remain a major political and security issue into next year, as will Syrian President Bashar al-Assad's reassertion of control after Trump's shock announcement of a US troop withdrawal from the country. The war in Yemen, which has killed about 10,000 people since 2014 and left some 20 million at risk of starvation, could take a crucial turn in 2019 after a ceasefire went into effect in mid-December. Numerous countries go to the polls in the coming year, including Afghanistan, Argentina, Australia, India, Indonesia, Nigeria and South Africa. Major sporting events on the calendar include the Rugby World Cup in Japan, the cricket one-day international World Cup in England, and the athletics World Championships in Qatar.